Cheval's new PDU line of power distribution units provides PDU level monitoring with on board "intelligent" option for remote monitoring and control. Note: Dimension are in mm. Hot Swap multi function LCD display shows real time Voltage, Current and Frequency. Readout can flip 180 deg. for easy viewing. High precision hydraulic magnetic circuit breaker. Two current transformers improve power management. On board "intelligent" options only require connection to Arion PDU Server (sold separately). Maximum 10 ampere current rating per individual outlet. Please see our Arion PDU Server product information for full details. Note: To utilize remote monitoring, Arion PDU Server is required. Install PDU fixing plate at bottom on both side of PDU with two Phillips flat head screw M4x8. Install Post Clamp Bracket to PDU fixing plate with M6 screw. Fix Smart PDU to Arion rack as shown below then slide upper Post clamp bracket up and slide lower Post clamp down until they stop. Tighten two of M6 screw with torque 70 inch lbs to complete installation. Arion PDU Server will enable the Intelligent features of our Arion PDU series to be fully utilized. Expand the functionality of your Arion Monitored PDU to an intelligent PDU able to monitor and control multiple devices. Easy to read LCD panel. 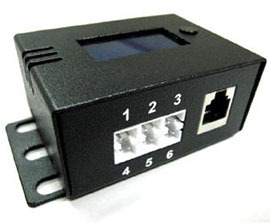 Plug and play enabled Ethernet access for system setup and remoter monitoring. Email, SMS and SNMP trap provides instant warning in case of abnormal event. 19" rack mounted uses only 1 U of rack space. One sensor input port to monitor temperature and humidity. Can expand up to 7 sensors with optional Sensor Expansion Module. On board alarm sounds when pre-set parameters are reached. 100/240 volt input, 50/60 hertz. Install two 19" fixing brackets on both sides of Arion PDU server with 3 of M3x6 taper screw on each side. See image on previous page. Install two M6 caged nuts into square hole at required U number on 19" mounting rail both left and right rail. Mount Arion PDU server to 19" rail with M6x16 Philips screw and plastic cup washer. Plug AC power cord to the AC input on the rear of Arion PDU server. Plug RJ 45 LAN cable to LAN port at right side on front panel of Arion PDU server. Plug RJ 11 link cable from Arion Smart PDU "PDU input" port 1-8 on front panel. The Arion PDU server comes with one on board port for a temperature and humidity sensor. With our optional Sensor Expansion Module (SEM), you can add 6 more sensor ports. Temperature probes come with 1.8 meters of cable and connects to the SEM. Simply plug the SEM to the PDU serverand use the pre-installed software to set up and monitor the devices. The SEM contains one on board temperature & humidity and can connect external 6 temperature probes for a total 7 temperature and 1 humidity probes. An LCD readout with selector button allows for local monitoring. Insert two M6 caged nuts (balloon 3) into square hole on rear flange of 19" rail at desired location. Fix SEM sensor box with two plastic washer and philips head screw M6x16. Tighten M6 screw with torque 25-30 inch lbs. Connect RJ9 from temperature sensor probe into input port 1-6. See image on next page. Add power points where you need them. Vertically or 19” mounted versions available with 12 or 24 outlets. 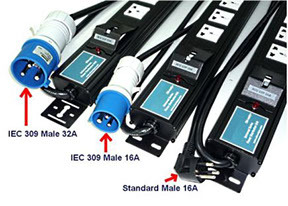 There are three types of AC plug for 16A and 32A series as shown below. Standard color is low gloss black. Cheval's new PDU line of power distribution units provides PDU level monitoring with an on board “intelligent” option for remote monitoring and control. Two 16A hydraulic magnetic circuit breaker for each Line 1 and Line 2. Display line frequency : 47-60Hz. Maximum 13 ampere current rating per individual outlet. Maximum 32A ampere current rating for total outlet. On board “intelligent” options only require connection to Arion PDU Server (sold separately).